Psyllium is a natural grain that has been widely studied and is used mainly as a source of fiber in dietary supplements. Learn more about this herb and how it can improve overall health. Psyllium, grown primarily in India and Pakistan, yields an outstanding 60 - 70% soluble fiber, eight times higher than oat bran. Since modern diets are typically low in fiber and high in carbs and saturated fat, adequate fiber supplementation is highly recommended, not only to aid digestion, but also to support cardiovascular health. Psyllium can help with this endeavor. Regular, moderated intake of psyllium treats and prevents numerous gastrointestinal complains, including diarrhea and constipation. It also helps the cardiovascular health and it has been approved by the Food and Drug Administration, which recommends a daily intake of 3 - 12 grams in order to decrease the risk of heart disease. Psyllium is commonly used to promote weight control, as part of a low fat, low cholesterol diet, and also in diverticulosis and diabetes therapies. Studies have shown that its polyphenolic compounds have some antioxidant effects, but further investigation is needed. Treating constipation. 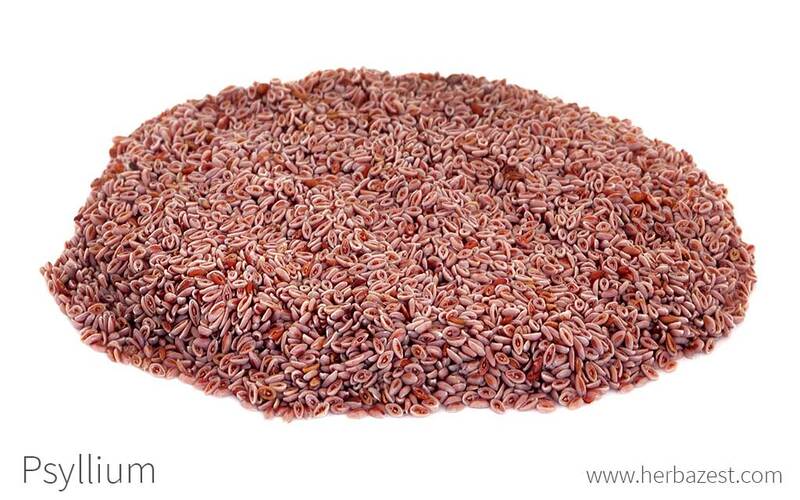 Due to its fiber content, it increases stool weight and promotes bowel movements. Improving cardiovascular health. Studies have shown that psyllium is particularly effective in the treatment and prevention of cardiovascular disease. Lowering blood sugar. People with diabetes have showed significant improvements in their blood sugar levels and insulin concentrations after incorporating psyllium into their diet. Lowering cholesterol. A study concluded that taking psyllium twice daily, along with a diet therapy, reduces LDL-cholesterol concentrations in men and women with primary hypercholesterolemia. A DAILY INTAKE OF PSYLLIUM CONTRIBUTES TO THE RELIEF OF IBS SYMPTOMS. Traditionally, psyllium has also been used as a demulcent, for treating urinary infections, as well as for the topical relief of skin infections. Chemically considered a polysaccharide, psyllium doesn't get absorbed in the small intestine, passing right through to the large intestine, where it is partially broken down by normal bacterial flora. In that environment, it absorbs the excess of water and increases around 10 times in volume, becoming a mucilaginous gel responsible for bulking the stools and stimulating their elimination. When it comes to improving cardiovascular health, some studies have shown that psyllium increases bile acid, which may help decrease fat absorption. Psyllium may also transform lipid metabolism by affecting the levels of proteins. Its mucilaginous gel is believed to influence not only the peristalsis, but also the absorption of nutrients, decreasing the absorption of cholesterol itself. Psyllium usually acts within 12 - 24 hours after intake. In some cases, the maximum effect is reached after two or three days. Herbs that have mild laxative effects are prune and flax, while cardioprotective and anti-diabetic properties can also be found in blackcurrant and lucuma. Potential side effects include intestinal bloating, diarrhea, nausea, and mild abdominal cramping. It is recommendable to start with a low dose and increase intake gradually to minimize discomfort. Taking it with an adequate amount of liquid (e.g. water, milk, fruit juice, or similar) will prevent choking or possible damage to the esophagus. The use of psyllium is not recommended in children of six years old and under. Laxative bulk producers should be used only in cases when dietary changes are unsuccessful and always before using other purgative methods. Psyllium should not be used without medical advice in patients experiencing abdominal pain, nausea, and vomiting, since these signs can indicate a possible intestinal blockage (ileus). Psyllium is rich in mucilage, which has thickening properties, so it is commonly used in recipes as an egg substitute, making it a popular choice for vegan, raw, and gluten-free diets. Since it has no taste whatsoever, psyllium is used to thicken sauces and add fiber to baked goods, and it can be sprinkled over salads and soups. Culinary applications aside, the health benefits of psyllium can also be obtained from supplements and home made herbal preparations. Seeds. Whole seeds are the most natural for of psyllium. They can be used in baking goods to add extra fiber, or soaked before being consumed with plenty of water for constipation relief. Husks. One or two tablespoons of psyllium husks can be mixed with a glass of water every day to promote regular bowel movements and control cholesterol levels. In this natural form, psyllium can be added to baking goods. Powder. Just like the husks, one or two daily tablespoons of psyllium powder are easy to mix with water, juices, or smoothies. It can also be used as a thickener for sauces, soups, and many culinary dishes, in order to reap psyllium's hypoglycemic and cardioprotective effects. Capsules. Psyllium can be taken as a supplement in capsules. To make the most of its cardioprotective and digestive effects, it is recommended to take a psyllium capsule with every meal. Maceration. For constipation relief, soak 20 g of psyllium seeds in 200 ml of water for 10 hours. Take the whole dose at night. Poultice. When psyllium husks are soaked in an infusion of calendula, they make an effective poultice for external treatment of skin infections, boils, abscesses, and whitlows. AS A DIETARY SUPPLEMENT, PSYLLIUM CAN BE FOUND COMBINED WITH OTHER SOURCES OF FIBER. Whether in natural forms or as a supplement, psyllium is easy to find in virtually every local market as an over-the-counter product, in capsules or powder, alone or combined with other sources of fiber. It also can be purchased online. Psyllium is an annual herb that grows up to 12 - 18 inches (30 - 46 cm) tall. Leaves are opposite, linear, or linear lanceolate, reaching 0.4 x 7.5 inches (1 x 19 cm). After about 60 days of planting, many small, white flowers bloom. The seeds are enclosed in capsules that open at maturity. In India, psyllium is cultivated from October to March during the dry season, while in France, sowing takes place in March, after the winter. Seeds are sown at a rate of 15 - 30 pounds (7 - 13.5 kg) per hectare, and they are mixed into the uppermost layer of soil using a weed broom and then irrigated. Psyllium needs clear, sunny, and dry weather, as well as light, well-drained, sandy loam soils. The temperature range that this crop prefers is 59 - 86°F (15 - 30°C). Water requirements are moderate for this crop. Psyllium is a low-growing, herbaceous perennial with dark green, egg-shaped leaves form a rosette, and are generally smooth or slightly hairy, with wavy margins and three or more clearly-defined, tough and fibrous parallel veins. Psyllium is the common name for several members of the plant genus Plantago. Plantago ovata and Plantago afra are other generic names for these species, all of them part of the Plantaginaceae family. The genus Plantago has more than 200 species that are grown all over the world, but P. ovata and P. afra are commercially cultivated in several American, South American, South Asian, and European countries as a major seasonal crop. All species of Plantago are indigenous to India and Pakistan, and have been used for over a thousand years in both Ayurvedic (Hindu) and Unani (Arab) medicine, for the treatment of digestive problems. However, the cultivation and medicinal use of the psyllium plant and seeds can be traced back to 250 BCE, in China. The first settlers brought psyllium to North America, where native Americans gave it the name of "white man's foot", as the plant was often found growing along well-trodden foot paths, and used it topically, to draw out the poison of rattlesnake bite, soothe rheumatic pain, treat wounds, and wash out eye infections. They also ate the fresh, young leaves and seeds of psyllium. The word plantago, originally from Latin, means "sole of the foot," alluding to the shape of the leaves. Psyllium is a word of Greek origin, meaning "flea" in reference to the color, shape, and size of its seeds. The seeds of psyllium have been used in Europe for intestinal health since the 16th century, and the early English called the plant "mother of herbs." Most of the annual imports to the United States, the number-one consumer of psyllium, come from India, including 800 metric tons of whole seeds and 3,000 tons of husks. Gardening. Psyllium plants are commonly used to prevent soil erosion. Pharmaceutical industry. Psyllium is utilized as a thickening agent for capsule formulation. Food industry. Psyllium is added as fiber to a variety of products, such as health drinks, beverages, ice cream, cakes, jams, instant noodles, and breakfast cereals. Fodder. Livestock animals are commonly fed with psyllium to aid their digestive system.